Kids will be eager to complete these math practice pages to solve the silly riddles that are guaranteed to make them giggle! Leveled for different abilities, each activity sheet reinforces a key math skill and includes a series of math problems that offer kids plenty of practice. 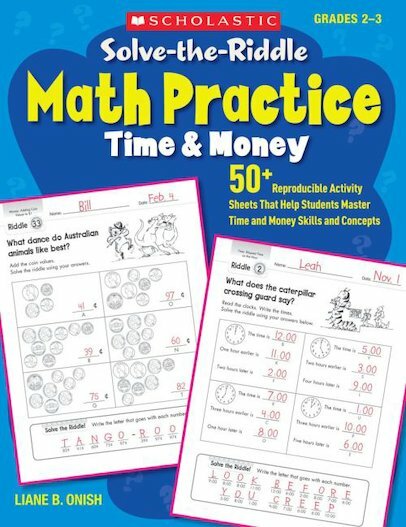 Covers telling time in different increments (analog and digital), elapsed time, reading schedules and calendars, adding coin and dollar values, computing and estimating prices, and much more. Flexible and easy to use as independent work, at centers, as day starters or homework. For use with Grades 2–3.